I like the cropping, the front paw in motion and the color in the tail. 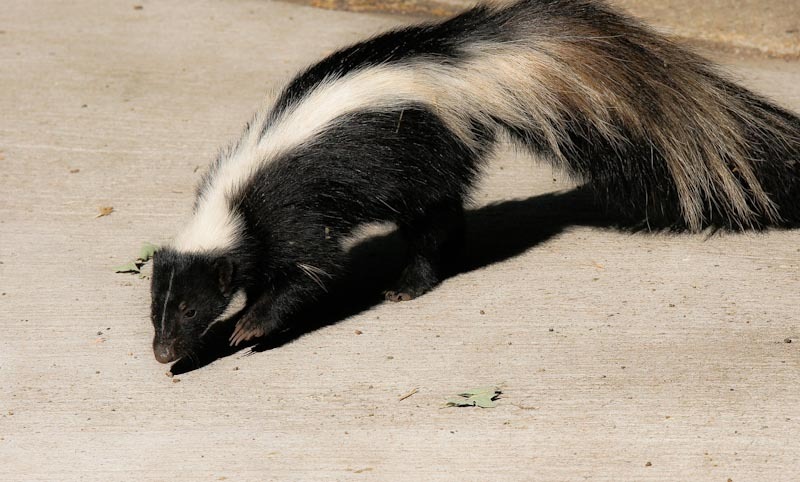 It can be challenging to remember that skunks are our friends and this photo brings a fine specimen up close and personal. Glad the cat food attracted this wild one. Cool catch and narrative. Wish many of the humans I know would give warning before letting it loose. What a gorgeous creature! And a nice reminder that the Wild Gulch includes more than the flora we have feasted our eyes on. just a gorgeous fellow!! excellent shot! I can't believe you let yourself get so close to this little guy!!! Wonderful capture. They really do look rather cute when you get up close and personal. Wow you got really close to one here, but how can you stand the smell? =) Great capture nonetheless! Amazing capture, you sure have a steady hand to get this shot off. Excellent details, interesting animal. makes me wonder about the length of your lens! Nice kitty...nice kitty... nice kitty... see I am backing up.